Nature Magnified: Kestrel attacking and being attacked! Kestrel attacking and being attacked! Today was another sunny day here, but the birds were scarce. With none venturing close, I had to focus on the far away birds in flight. The light was mixed and I struggled to get good pictures at the long end of my zoom. The auto focus struggled and many a time, I preferred to focus manually. 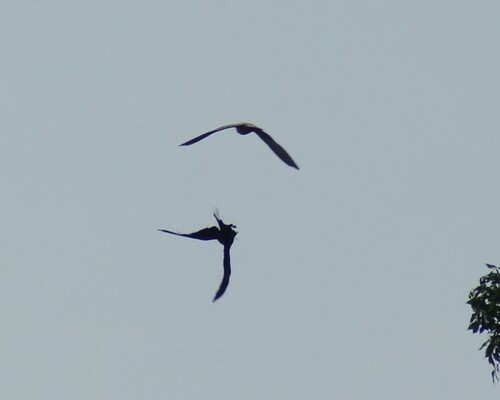 Sharpness was poor at best but I did record some interesting Kestrel attacks – on and by it. I’m guessing there is a nest somewhere in the vicinity of the area where I always spot these Kestrels. 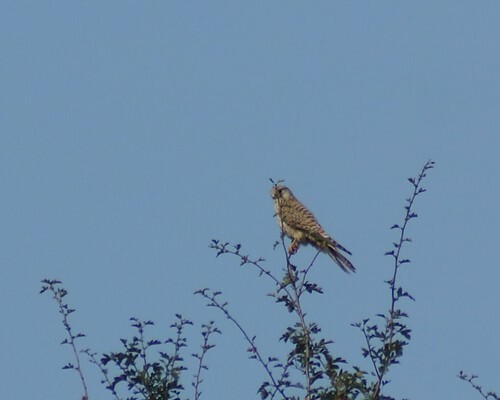 However, its not just the Kestrels that seem to own the area. I must have counted at least 8-10 magpies in the area, and I’m guessing they too nest around the area. It is well known that magpies drive away birds of prey and that’s what was on display early on today. However, with the constant dodging and swaying mid air tactics, I soon began to wonder who was chasing whom? however, the issue was sorted when reinforcements arrived from the magpie clan! 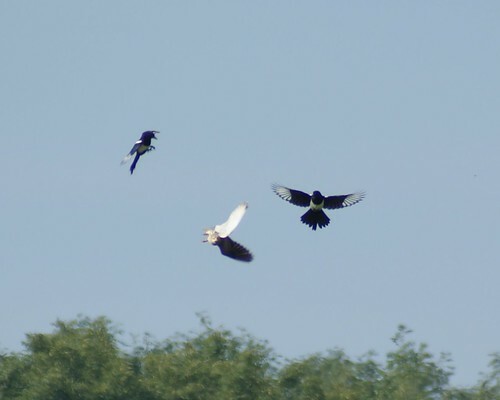 Another magpie joined the fight in mid air. The kestrel had enough and flew away. However, that wasn’t a permanent retreat. 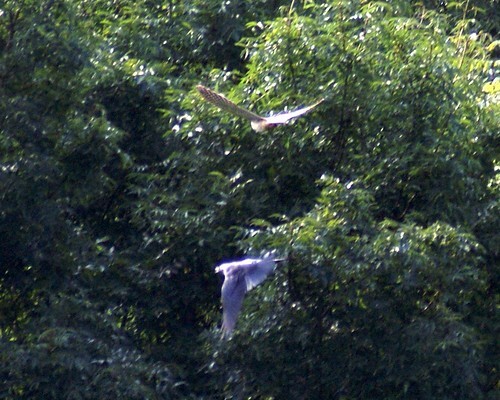 The kestrel was soon back and looking to retrieve pride, was actively looking for a fight! 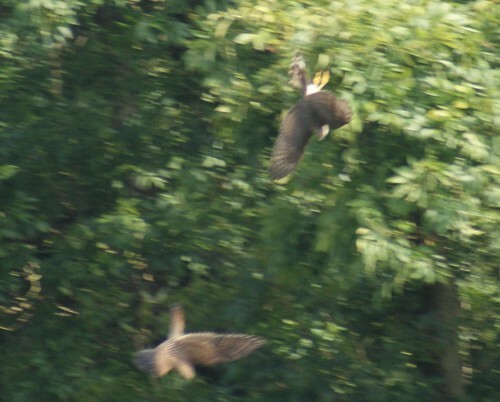 It sat for a while on a tree top before launching into the woods around 200m away where a crow sat. 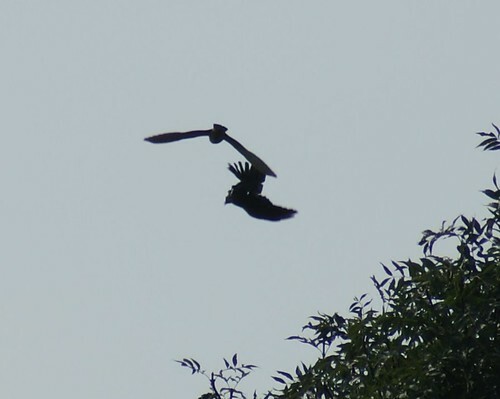 The startled crow took off, with the kestrel giving hot pursuit. 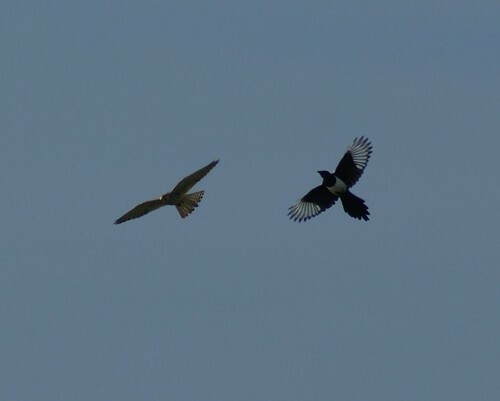 however, the laboured flight of the crow seemed no match for the smooth speed of the kestrel. ..but just when it seemed that the crow was in for a hiding, the crow did a most amazing thing. ..it did a mid-air somersault ! 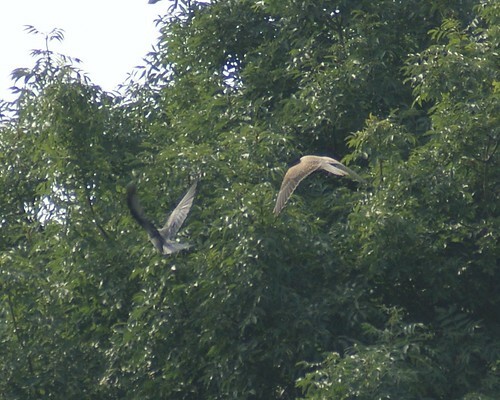 and with the smooth speed of the kestrels flight, it overshot the crow, which meant the crow was now behind the Kestrel! No wonder they say crows are intelligent! 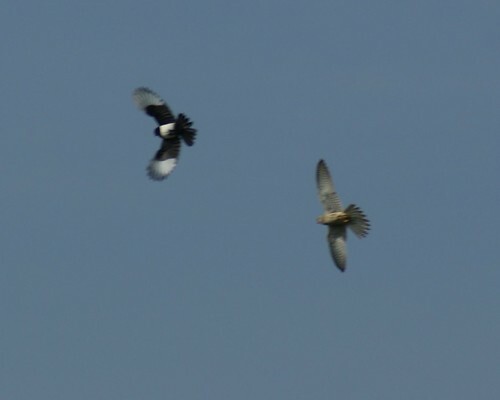 Outwitted, the kestrel soon gave up the chase and the crow got away. 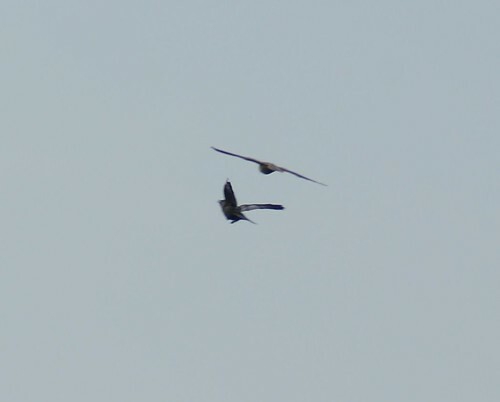 Another chase I couldn’t quite capture was this one between the kestrel and what appears to be a buzzard or sparrowhawk. 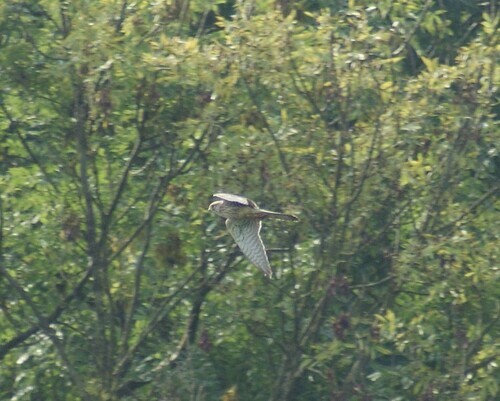 This time again, the kestrel was the one being chased! Looks like it was a tough day in office for the kestrel! 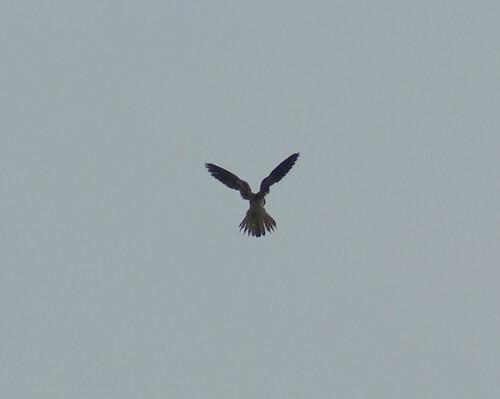 I`ll leave you with this picture of a hovering kestrel. So beautiful pictures. A very important bird report. Really cool shots! What a great SWF post! Well done. Wow, what a great sequence. An all-out sky war among the raptors. Absolutely superb series of shots. Birds in flight are not easy subjects and to catch spitfire dogfights like that is really fabulous.